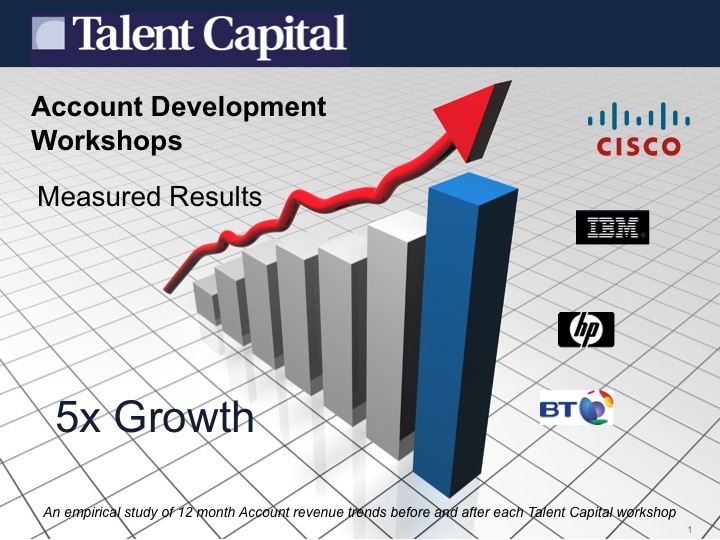 Talent Capital’s Account Planning Workshops are the fundamental building block of our client’s sales and business development activity. Never straying far from pragmatic, practical realities and using a “Challenger Sales” approach, these workshops are designed from the outset to be a practical action plan for coordinated teamwork and immediate implementation. With intelligence, insight and a practical realism grounded in hundreds of customer interviews, we take the extended account team through a rigorous yet flexible process to turn over every stone and note every idea to define a team strategy and detailed action plan. 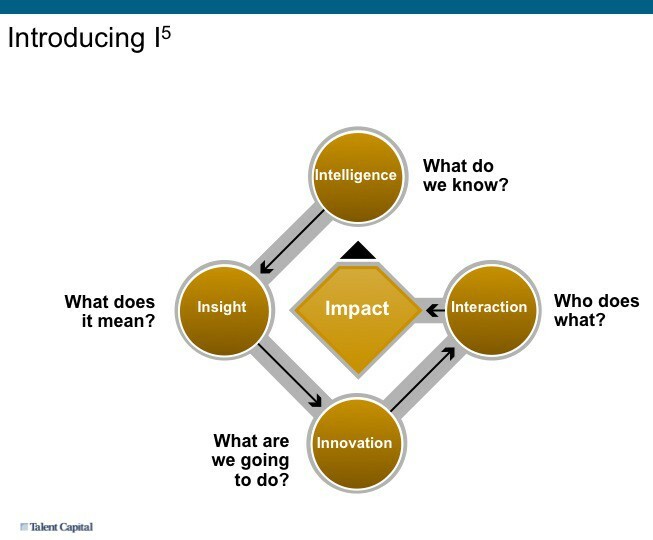 With experience across internal divisions and different companies, we are able to ask the hard questions and expose perceived and hidden weaknesses to take the team through a journey of discovery, realisation, innovation and ownership that transforms the customer engagement and translates into an immediate account revenue uplift in the vast majority of cases. Our unique approach owes something to our appreciation of the importance candidate reference reports in high quality retained executive search assignments. We follow the same proven methodology and art in eliciting comprehensive “Account Reference Reports” through open-ended interviews with our client’s customer. The combined effect of these interviews followed by our facilitated account planning workshop is truly astounding. On average, for accounts subject to this rigorous treatment, revenue grows on average five times more than the rest. 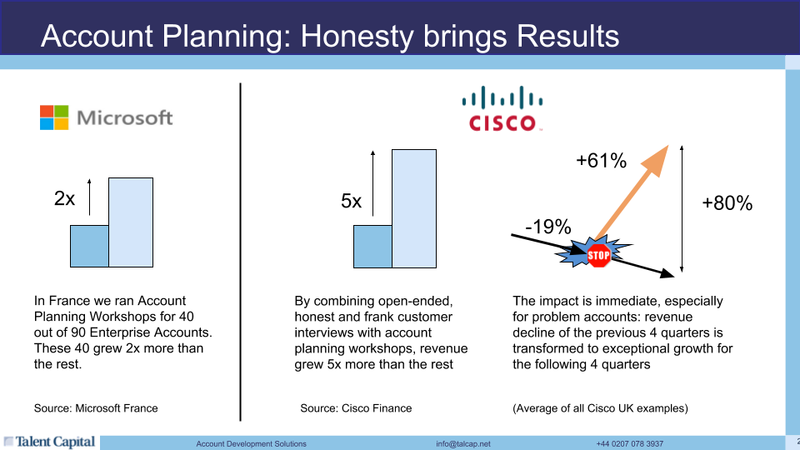 By taking ownership of the customers perceived problems, problem accounts turn around fast and within a few months of the interview + workshop a declining revenue trend is transformed into sustained, exceptional growth. 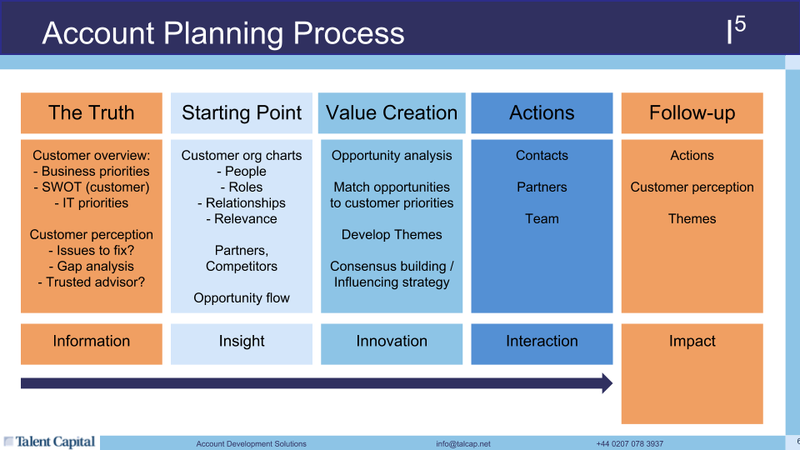 Our “I⁵” Value Creation methodology is thus taught by the proven “learning by doing” technique and can be replicated consistently across all accounts using our custom Salesforce App. Contact us to find out how our I⁵ Value Creation workshops and Salesforce App can transform your sales organisation and drive extraordinary revenue growth.